‘”We cannot negotiate with those who say ‘What’s mine is mine and what’s yours is negotiable’”. So after all the negotiation, tension and gamesmanship of the past few weeks Greece is essentially back to where it started. Have no doubt about it, the announcement that Syriza has agreed to a four month extension of the existing bailout programme is a defeat for the new Greek government. As predicted on this blog over the last couple of weeks, it was always likely that a short-term deal would be found which could keep Greece in the game and offer some breathing space for all sides to work out a long-term deal. This is not the bridging loan envisaged by Varoufakis in his opening Eurogroup discussion but it does at least offer the much needed finance and some element of budgetary freedom. But it does so at the expense of maintaining the crushing austerity measures which were at the heart of Syriza’s electoral campaign. It is hard to see how Syriza can dress this up as anything but a defeat and as Varoufakis’ erstwhile nemesis, Wolfgang Schäuble (maybe he should be renamed Wolgang Schadenfreude) has delighted in pointing out, this deal will be hard to sell to the Greek people. But if the popular press is to be believed, the Greeks have not reacted badly to this austerity extension. Perhaps political pragmatism has come to the fore with recognition that this was the best deal on offer. However, Syriza has until tomorrow to present its creditors with a list of reforms that will accompany the finance extension. The devil, as always, will be in the detail and Tspiras and Varoufakis will be hard pressed to word this in a way which maintains their commitment to shaking off the shackles of austerity. It seems incredible that Syriza has only been in power for a few weeks. But more incredible is the extent to which they have bent to the will of the troika and the Eurogroup in the face of inflexibility from their negotiating partners. Talk of 50% debt haircuts was watered down into growth-linked bonds before finally morphing into what looks like a continuation of the current programme. This is not only a defeat for the democratic will of the Greek people, who had firmly rejected the current austerity measures, but it is a reinforcement of the financial straight-jacket which has been at the root of Greece’s humanitarian crisis. Syriza may have secured additional short-term funds but much of this will be returned to its creditors in the form of debt and interest repayment. Very little (if any) will find its way to the Greek people, who must continue to suffer so that financial principles can be upheld. So it is worth asking whether Syriza could have played its hand better in representing the will of its supporters. 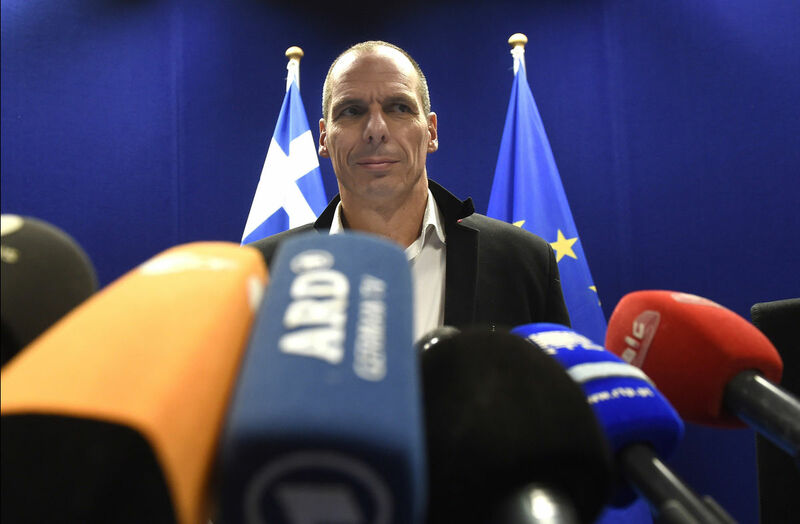 At the beginning of the month Varoufakis charmed the press on his tour of European capitals. Flying economy class and dressing like an ageing rock star, he seemed like a breath of fresh air among the stuffiness of the Brussels and Westminster insiders. But despite his much-vaunted background in game theory it looks like his nativity at the negotiating table has cost him and his party dearly. It seems to me that two important errors were made. Firstly, Varoufakis was quick to show his flexibility and academic credentials with the concept of growth-linked bonds, designed to assuage the doubts of creditors and allow the Greek economy some room to breath. This could have proved a pragmatic and sensible compromise but the fact that it was dismissed out-of-hand is a signal that Germany and the Troika felt that this attempt at compromise was a sign of weakness. The creditors could smell blood and needed no encouragement to move in for the kill. Perhaps if Greek compromise measures had been introduced later in the process they may have carried more weight. The second issue is more fundamental and one which goes far beyond immediate financial implications. Why was Syriza not more vocal in raising the prospect of debt default and euro exit? Merkel has showed time and time again her belief that the irreversible nature of euro membership is essential to the success of the currency union. Although there are obviously limits to what can be done to ensure this, the stability of the union has been the core consideration throughout negotiations. Why then did Varoufakis not threaten to use his nuclear option – a Greek default and euro exit unless austerity conditions are changed? The answer probably lies in the beliefs of Varoufakis himself. The self-proclaimed erratic Marxist has been widely quoted as saying that Europe is not ready for revolutionary action and that European capitalism must be supported until a better alternative is found. In the absence of this workable alternative he has therefore committed himself to siding with the insiders rather than be the strong voice of dissent that many hoped he would be. But this looks to have backfired on Syriza and seriously undermined its bargaining position. Without at least the public threat of default, Syriza had very little to offer the creditors at the negotiating table and as talks went on it became clearer that they would end up toeing the line. We will likely see tomorrow that the measures proposed by the Greek government will not differ much from the programme accepted by its predecessor and hated by its voters. But have no doubt that this is an unsustainable situation. Syriza has agreed an additional 4 months of funding but what will happen after that? With more bonds maturing in the summer and a deepening solvency crisis, Greece will not be any better placed at the end of June to demand concessions from the Troika. Perhaps there is still a glimmer of hope that the Greek government will submit proposals tomorrow which will demand substantive change on the ground and not simply be an extension of the current programme. This certainly seems unlikely and would probably signal the end of negotiations on all sides. But this may be the only viable option open to Syriza if it wishes to remain true to its electoral pledges and its desire to free Greece from its debt-fuelled humanitarian crisis. As a starting point the government needs to bring in capital controls immediately. This should have been done at least a week ago but with billions of euros fleeing the country daily this is now at critical point. Markets of course do not react kindly to such moves but ignoring this problem will not make it go away, and avoiding a liquidity crisis should be the government’s first priority. With this done it is surely time for Syriza, with the backing of the Greek people, to show its final hand: with the current socioeconomic station being unsustainable, Greece cannot continue to submit to the will of its creditors. In the absence of any flexibility or humanitarianism from its negotiating partners it is time for Greece to publicly threaten to leave the Eurozone. Maybe this will be a wake up call for the Eurogroup ministers and maybe it won’t. But from the Greek perspective there simply are not many other options at this moment which will allow them to wrestle back control of their own destiny and at least try repair its broken economy in the way demanded by its voters. That such a myopic, uninformed view of events is printed in a supposedly left-wing paper would be depressing were this view not so widespread. Considering the Greek crisis to be just a blip in the march of European integration and capitalism rides roughshod over the millions of people suffering under harsh austerity measure and left at the margins of society. The humanitarian costs of being able to eventually “relax austerity” do not seem to bear consideration as long as “the banking system will get through intact” and that the EU “will resume growing”. But where, we may ask, is there room for national sovereignty and democracy in this self-repairing, ever-growing European behemoth? And where does that leave the millions of people who do not identify with this finance-driven vision of Europe’s future? Just a few weeks ago it looked like Syriza offered the greatest possibility of answering these questions by promoting a platform based on true national and socialist principles. But they have been roundly defeated at the negotiating table, forgetting, as John F. Kennedy once said, that ‘“We cannot negotiate with those who say ‘What’s mine is mine and what’s yours is negotiable’”. Is it all over for Greece, common sense and humanitarianism? News, views, reviews and boo hoos for YOUSE.